Speak Easy is every bit as weird and wonderful as I could hope for or expect of a new novella by Catherynne M. Valente. 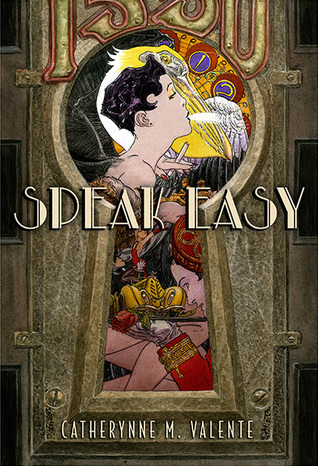 As is characteristic of the author’s work, Speak Easy is a lush tapestry of beautiful prose, full of cunning wordplay, richly detailed descriptions, and a cast of eccentric characters. My favorite thing about any Cat Valente book is the sense of space she achieves in every world she creates. The hotel Artemisia is no different. Reading Speak Easy is like walking into the hotel and taking a guided tour with someone who has lived there their entire life. They know all its nooks and crannies, but there’s really no end to the secrets of the place. Every page of this book is full of life and color and drama, and Valente seems to almost effortlessly weave a picture of a vibrantly wonderful world. Speak Easy is being sold as a retelling of The Twelve Dancing Princesses, but you may not see it unless you know the original fairy tale very well. Valente is a shrewd scholar of fairytales and mythology of all kinds, and she has a keen talent for adding her own embellishments and twists. Her deep love, appreciation, and understanding of the form shines from every single page. At the same time, though, there’s an awful lot packed into this slim little story. It’s not just an old fairytale; it’s also A Midsummer Night’s Dream and a particular moment in America’s literary history. It’s tragedy and comedy and heaven and hell and the exploration of these dualities. It’s a story about creativity and what it takes to be an artist. It’s a story about stories and where they come from and who they belong to. It will break your heart in the best way. Not gently, though. My first exposure to Valente’s work was her Fairyland books for young readers, which I read aloud to my daughter until she finally decided she was too old for bedtime stories any longer. I’ve since decided that every single thing Cat Valente writes deserves to be read aloud, just for the sheer joy of feeling her words roll off one’s tongue. Read it to a baby (goodness knows they don’t know any better) or to your pet or just to yourself in the privacy of your own home. Just do it, because it’s beautiful. Then go do the same with all of Valente’s other work. The only negative of this book is that the hardcover is extremely expensive. Unless you are a collector of books, I’d suggest opting for the ebook, which is the best $5 you could spend this year.